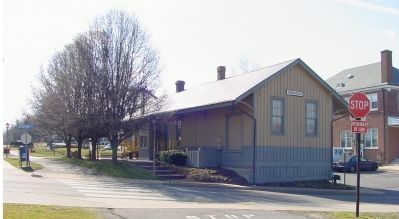 Herndon grew up around this railroad station. 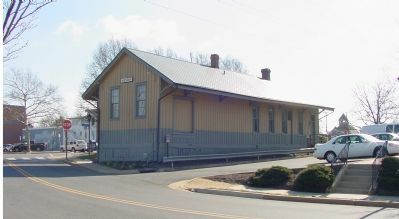 The town received its name in 1858 when the Alexandria, Loudoun & Hampshire Railroad (later the W&OD) arrived and a post office was established in the newly built station. Herndon quickly became the commercial center for a booming dairy industry in the surrounding countryside. Mills, farm suppliers, and retail shops were established near the railroad depot. As businesses expanded, so did the population. Local resident Madeleine Sharp described how Herndon life in the 1940s revolved around trains: There was a 6:30 a.m. train for business people. There was a 10:00 a.m. shoppers special (time enough for lunch at Woodies and a look around the shops) and there was a 6:30 p.m. theatre train . . . A wave of the arm at the stop, or the sight of a frantic figure running across the lawn was all that was needed to stop the train and receive a welcoming nod from the engineer. Erected by Washington and Old Dominion Railroad Regional Park and The Northern Virginia Regional Park Authority. Pavement is the 45-mile long Washington and Old Dominion Trail, which is on the former right of way of the Alexandria, Loudoun and Hampshire Railroad from Alexandria to Purcellville. Station Street is between the markers and the station. This marker is included in the Washington and Old Dominion Railroad marker series. Location. 38° 58.226′ N, 77° 23.157′ W. Marker is in Herndon, Virginia, in Fairfax County. 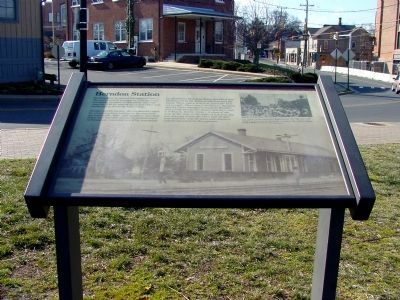 Marker is on Station Street north of Elden Street (Virginia Route 228), on the left when traveling north. Touch for map. This and two other markers face the Washington and Old Dominion Trail, which crosses Station Street at the markers. 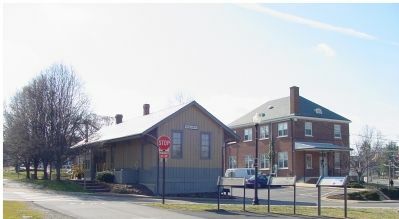 The old railroad station is across the street. A free municipal parking lot opposite the old train station—now a visitor's center for the Town of Herndon—is a few steps from the markers and the trail. Marker is in this post office area: Herndon VA 20170, United States of America. Touch for directions. Other nearby markers. At least 5 other markers are within walking distance of this marker. Mosby’s Herndon Station Raid (here, next to this marker); Tracks Into History (here, next to this marker); This is W&OD Trail: Herndon! (within shouting distance of this marker); World War II Memorial (within shouting distance of this marker); Acetylene Gas Generating Station (about 300 feet away, measured in a direct line). Touch for a list and map of all markers in Herndon. More. Search the internet for Herndon Station. Credits. This page was last revised on June 16, 2016. This page originally submitted on March 10, 2006, by J. J. Prats of Powell, Ohio. This page has been viewed 4,875 times since then and 31 times this year. Photos: 1, 2, 3, 4. submitted on March 10, 2006, by J. J. Prats of Powell, Ohio.